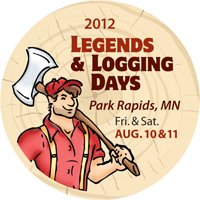 Park Rapids annual "Legends and Logging Festival" is on August 10th and 11th this year. The festival is a celebration of the area's history, culture, artisans and food. Click on the picture of the Legends and Logging Days button (above) for time, location and other detailed information.